A couple of years ago when I was pregnant with Caedmon I enrolled Leighton in gymnastics at our local recreation center. It was actually “Mommy and Me” gymnastics which is a lot of fun when one is 7 months pregnant. I did it because Leighton was very timid and hesitant climbing and exploring and very unsure of himself. Well it must have worked because a few months later my once timid and shy little guy suddenly was climbing and exploring all over the playground. So much in fact that he actually fell off and broke his foot. Go figure. But he really enjoyed gymnastics and this past fall started asking if he could do it again. We started at the rec center again and they had a good program but this winter we switched to a new gymnastics place and he is really enjoying it. The new class not only works on “skills” (at age 4 that term is used VERY loosely) but they also practice with the kids their ABCs, and numbers and colors and shapes. Leighton has really been enjoying it. 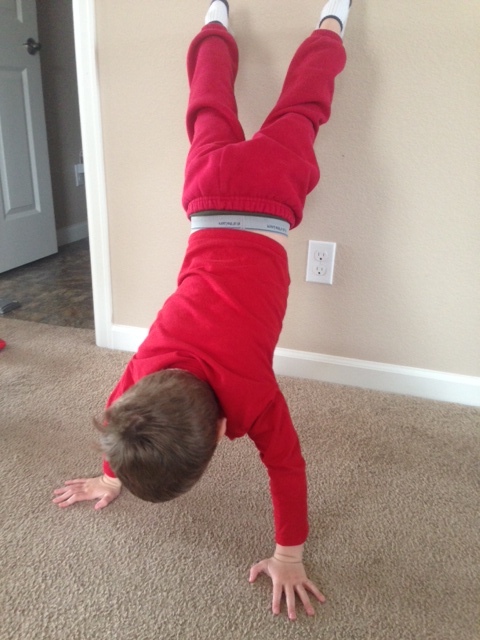 One of the things that they have been working on in his little class is handstands against the wall. To practice to see how long they can do it, they sing their ABCs. And so we’ve been practicing handstands and singing our ABCs at home as well. Yesterday morning I was playing with Caedmon while Leighton was at preschool and we were talking about different colors, granted to him everything is “blue” or “yellow” in his little almost 2 year old voice. I was showing him a block with different colors and trying to teach him that the world is not blue and yellow (let alone black and white). I made the suggestion that we sing our ABCs too. He looked at me and immediately stood up and ran over to the wall and pointed to it and in his two year voice and words told me that we needed to do “has stands” or hand stands. He clearly has been watching his older brother. And so I helped him do a “hand stand” which is really just me holding him up upside down with his hands touching the ground while singing the ABCs. We finished and he stood up, looked at me, pointed to the wall and said “Mommy do”. The next thing I knew I was doing a handstand against the wall while singing the ABCs. Caedmon thought it great fun to walk underneath me while I was doing all of this which started me giggling. I made it though my ABCs and hopped down and Caedmon looked at me, smiled and pointed to the wall and said “gin” which in toddler speak means “again”. And so I spent the next number of minutes doing handstands, singing the ABCs with my almost two year old marching along beneath me. It was actually a ton of fun and still makes me giggle thinking about it. It’s not often the big moments that make mommyhood the joy and fun that it is, it’s the little moments inbetween and day to day that matter. There are tough and hard times with being a mom (ie cleaning up vomit, or any other bodily fluid that has been spread all over the bed, dealing with a tantrum in the middle of the store or even the middle of the living room, discipline not working, etc) but there are victories and so many joys along the way. Even goofy times of handstands and ABCs.